Part of how you and I can create change, as busy moms who often make the household purchases, is to change where we spend our money. There are many, many fair trade or social good companies who make accessories and purses and they are wonderful, but I hardly ever spend money on myself. That’s why I get so excited when I find social good items (as I like to call them) that my family can use everyday and I can easily and affordably replace my existing brand. 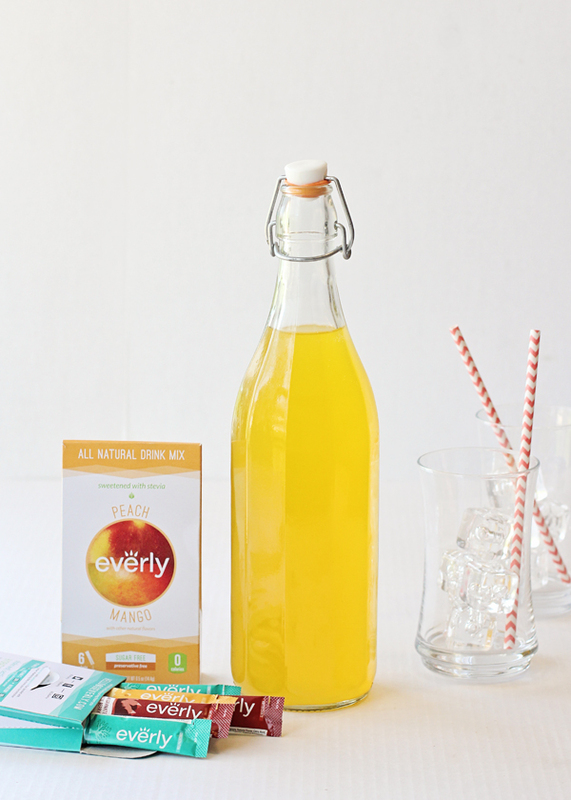 Everly is an all-natural, 0 calorie, sugar free and preservative free drink mix. They come in the flavors peach mango (my favorite), green tea passion fruit and pomegranate maqui berry. For every box of Everly purchased, they provide a packet of a life-saving mix called oral rehydration salts to treat children sick with waterborne disease. Oral Rehydration Salts rapidly rehydrate victims of waterborne diseases. These packets save lives. Everly provides the funds to the non profit ColaLife for the production of these ORS packets which are produced in Zambia by Zambians. These packets come in a kit that also contains zinc supplements and soap which helps treat diarrhea. 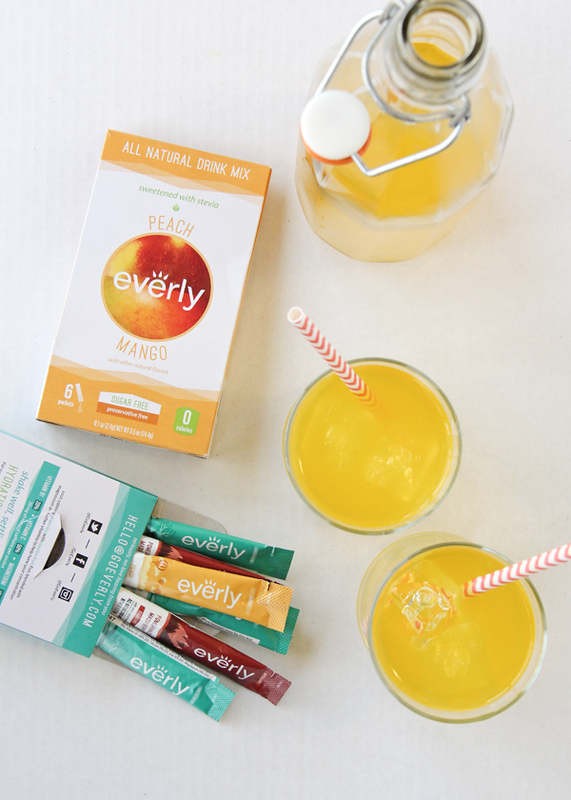 Put Everly in your lunch boxes, serve it at get-togethers, drink it at the gym. You can help reduce the number of people who die from waterborne diseases by a simple drink. You can purchase Everly drink mixes here on Amazon! Water is great and many times its easy to get people to drink it if they want flavor. Stay hydrated. I have always been weary about drink mixes in the past worried it had too much sugar. I am glad this brand is all natural! The Everly doesn’t come from Zambia. It’s make in Nashville, TN. The ORS packets, which are the life-saving packets given to people who have waterborne diseases every time a box of Everly is purchased, is made by the Zambian people. The Everly packets don’t contain rehydration salts. For every box of Everly sold, they give an ORS packet (which is oral rehydration salts) to people with waterborne diseases. These help with hydrating the body when many people die from these treatable diseases. Peach mango sounds so refreshing. I’d love to try this. This sounds like a great drink. I will have to try it. I love that it is all natural. I love that these are all natural, and even more I love that they provide help to those who need it. What a great product! You had me at zero calories! I’m always looking to enhance my drinks, sounds delicious! I really want to try this now! I’ve been looking for a good 0 calorie drink since I just quit drinking Mountain Dew. That looks and sounds so good!! Peach Mango is one of my favourite flavour and it’s great that it’s 0 calories. I love that they are all natural. So many drink mixes have things in them that I really don’t want to put in my body! These would be good for athletes that loose so many electrolytes when they sweat! I mean, if they contain rehydration salts, isn’t that waht they are for? It looks really tasty! And it comes from Zambia! That makes it even more interesting! The mango does look and sound delicious. I haven’t tried these yet, but with my Amazon membership they’ll be here in two days. Can’t wait! Not only do the Everly packets sound delightful, purchasing them does good. It’s a no-brainer! I can’t wait to try them. I like products that a socially conscience. I like that the product is natural and has zero calories. We are definitely into all natural drinks. I’ll have to see if I can find that – haven’t heard of it. We like the small pouches too, so convenient. I’m not a fan of water so anything I can add to sweeten it up is a plus for me! I haven’ t heard of these before, but they do look good. You are right. Perfect for the gym bag! I think peach mango has to be one of the best flavors in the entire world. I can’t wait to try this! This is the first I am hearing about Everly. I like that it is zero calories and it helps those in need. What a great brand! OK I love this type of thing, it’s all I drink! But I haven’t seen these or heard of these before! They sound great! I love that it’s all natural! My daughter loves water mix ins, I’ll have to grab some for her! This sounds like a great drink mix. It is great to see that you can help others by buying this product. I will have to try it out. I love drink mixes to spice up plain water. This one sounds like it’s delicious and I love that it helps people. Oh wow I have never heard of Everly before. I’m going to check it out! These sound so good, and I love that it’s all natural! Usually, 0 calorie drinks are made with artificial stuff.